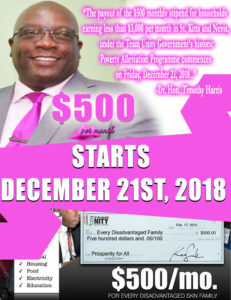 BASSETERRE, St. Kitts, December 6, 2018 (Press Unit in the Office of the Prime Minister) – The payout of the $500 monthly stipend for households earning less than $3,000 per month in St. Kitts and Nevis, under the Team Unity Government’s historic Poverty Alleviation Programme commences on Friday, December 21, 2018. 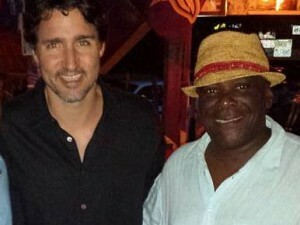 “This is a major development – one of the best social development initiatives to be implemented over the past 30 years, and fulfils a promise made by our Team Unity Administration in the campaign leading up to the historic General Elections in 2015,” said Prime Minister and Minister responsible for Sustainable Development, Dr. the Honourable Timothy Harris in an address to the nation today, Thursday, December 6, 2018. The Poverty Alleviation Programme is designed to help disadvantaged households meet some of their essential living expenses and, in so doing, improve their standard of living. Prime Minister Harris has on several occasions encouraged persons who will benefit from the social assistance initiative to use the $500 monthly stipend wisely. The Poverty Alleviation Programme was implemented in three phases, starting with the data collection drive in August. This was followed by an investigative and assessment stage during which the data collected was verified to determine whether individuals who applied for the assistance were genuinely eligible. The last phase – the commencement of the monthly stipend to qualifying households – begins on December 21, 2018.